"Wash away" those boring earrings and get creative with these Distressed Washer Earrings from Irene Helms! These earrings are fashionable and affordable! Handmade jewelry means you'll always have earrings to match your favorite outfit! Hammer the brass washings to give them texture - I used a checkered head hammer to add texture, but you can use a plain household hammer over something like plain concrete to give texture. If you are hammering inside, use a sturdy table or surface. I used a wood chopping block which I set on top of a kitchen counter top. I textured both sides, but you can choose to only do one side if you like. Apply Gilder's Paste to brass washings. Simply rub the paste onto both sides of the washer using a soft cloth - a cotton T-shirt works very well, or use an old washcloth. Let the paste dry about 10 minutes. Rub again with the cloth to remove excess. Sand the surface and sides of the washer with either fine sandpaper or a nail file. Polish with a polishing cloth. Seal with Diamond Glaze or a lacquer sealant for metal. Seal one side and let dry about one hour, then glaze the other side. Use an antiqued brass chain to loop and stack the washers together onto the earring wires. So cool! This is the perfect gift for someone who loves shabby chic jewelry. 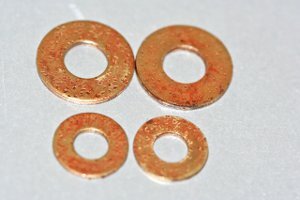 You can use the washers to make a bracelet too. I've realized I can reuse even plumbing equipment for my crafts thanks to this site. 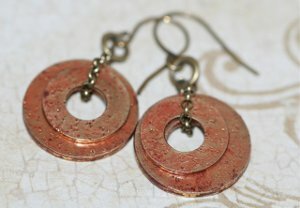 These distressed washer earrings are so cool looking and I love that you can recycle some old washers. This is so unique looking and would make a perfect gift for that person that likes unique things. So simple and very easy and I love the idea to make a necklace to go with it and add some antique oval jump rings in between the washers to form the chain. This will be a great addition to a jewelry collection and some of your friends will envy you. oh these are so nice and different. Christmas is not that far away either. so making several would be easy. guess I'll be shopping in a different dept now. thank you for posting this. Cool idea! Probably would be a pretty necklace, too.